: Sheepdog and guard dog. : Known for a long time as Chiens de Berger français de Plaine (French Lowlands Sheepdog). It was in 1809, in the Abbot Rozier’s “Complete Agricultural Course””, that the name “chien de Brie” appeared for the first time. : The Briard is hardy, supple, muscled and well proportioned; lively and alert. The Briard is of medium build. The length of the body, from the point of shoulder to the point of buttock, should be slightly greater that the height at withers. The head is long 2/5th of the height at withers. The width of the skull is slightly less than ½ of the length of the head. The skull and the muzzle are of equal length. : Balanced temperament, neither aggressive nor timid. The Briard should be steady and fearless. : Strong, long, covered with hair forming beard, moustache and eyebrows slightly veiling the eyes. Seen from the side, the lines of the skull and muzzle are parallel. : Strong, very slightly rounded seen from the side. : Pronounced; at equal distance from the occiput and the tip of the nose. : Strong. The nostrils are well open. The nose is always black except in blue dogs which have either a blue or bluish nose. : The end of the muzzle is rather square. Muzzle strong, sufficiently broad and never pointed. : Strong jaws; white teeth. Scissors bite. : Oval. Horizontal, well open, rather large and of dark colour. In blue dogs, paler coloured eyes are permitted. : Set on high, not plastered against the head and rather short if left natural. The length of the cartilage of the uncropped ear should be equal to or slightly less than half the length of the head. The ears are always flat and covered with long hair. If cropped, in countries where this practice is not forbidden, they should be carried erect, neither divergent nor convergent. : The back is straight. The loin is short and firm. : Only slightly sloping, of slightly rounded shape. : Wide and long, well let down to the elbows ribs well sprung. : Natural, carried low, it reaches at least the hock joint, without deviation, forming a slight hook like a “J”. In action, the tail may be carried at the highest in prolongation of the topline. : Well muscled with strong bone and upright. : Oblique, well angulated, moderately long, fitting closely to the thoracic wall. : Slightly sloping, seen from the side. : Strong, round and well in axis with the body. The nails are always black (except in blues) and the pads hard. Toes should be well knit and arched. : Strong, round. The nails are always black (except in blues) and the pads hard. Toes should be well knit. : Not too low down and well angulated. : Perfectly vertical, seen from behind. By tradition, the shepherds want to keep the double dewclaws. The dewclaws form thumbs, well separated and with nails, relatively close to the foot. : Regular, supple, harmonious, in a manner which allows the dog to cover ground and accomplish its work with a minimum of effort and fatigue. 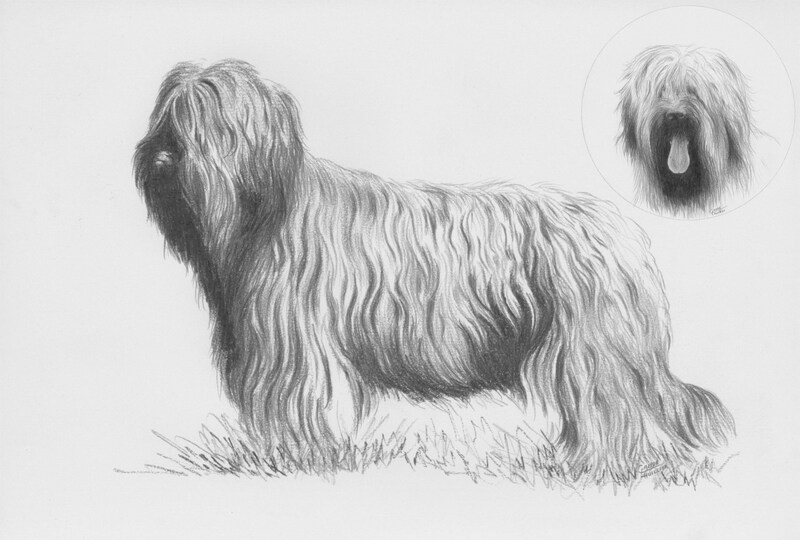 The Briard should have a long trot with good reach and good thrust from behind. : Goat-like texture, dry, supple, long, with slight undercoat. Black, fawn, fawn with black overlay (slight to medium) often with mask, grey or blue. Females 56 – 64 cm at the withers. Coat insufficient length (less than 7cm), hair soft or woolly. Nose of colour other than black or blue; presence of pink (unpigmented areas). Overshot or undershot with loss of contact of incisors; absence of 2 lower PM4 or absence of 3 teeth or more whichever they are (except for PM1). Eye too light (yellow), wall eye. Ears curling inwards, set on too low beneath eye level, covered with short hair, naturally erect. Tail curled up or carried vertically. Single dewclaw or total absence of dewclaws on hindlegs. White, brown or mahogany colour; coat of two distinct colours; white blaze, white hairs on the extremities of the limbs, fawn coat with saddle. Size outside the limits of the standard with tolerance of +2cm or -1cm.